It says something about Blogger‘s ease of use that model railroaders are using it to build web sites for their layouts. A decade ago it would have been Geocities. It’s good to see: considering the length of time it takes to build a layout, the blog format — regular entries, chronologically arranged — is a natural fit, even if the blogs in question are sporadically updated by blogging standards. 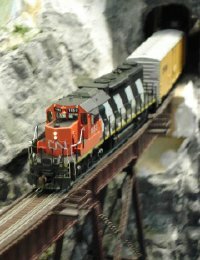 Anyway, here are a few more model railroad blogs for you to have a look at: Ken King’s Kootenay Western, David Haney’s North Conway, and Chris Lyon’s Lyon Valley Northern. Chris’s blog shows the progress of his layout’s construction; Chris and Ken intersperse their layout photos with a good deal of railfanning and travel photos; and David’s blog has only a single post so far. All were started within the last year. Via Friday Night Group.